A big part of the work we do at the Active Transportation Alliance involves educating the public about our goals of better biking, walking and transit. We’re a trusted local authority on these issues, and that’s reflected by the media coverage about our campaigns, advocacy work and events. By getting the word out in local media, we invite more people to understand and support our mission. Chicago has become the first city in the nation to publish anonymized data from ride-hailing apps for providers like Uber, Lyft and Via — something Active Trans has advocated for in order to get a better understanding of how ride-hailing services impact the local transportation network and legislate accordingly. 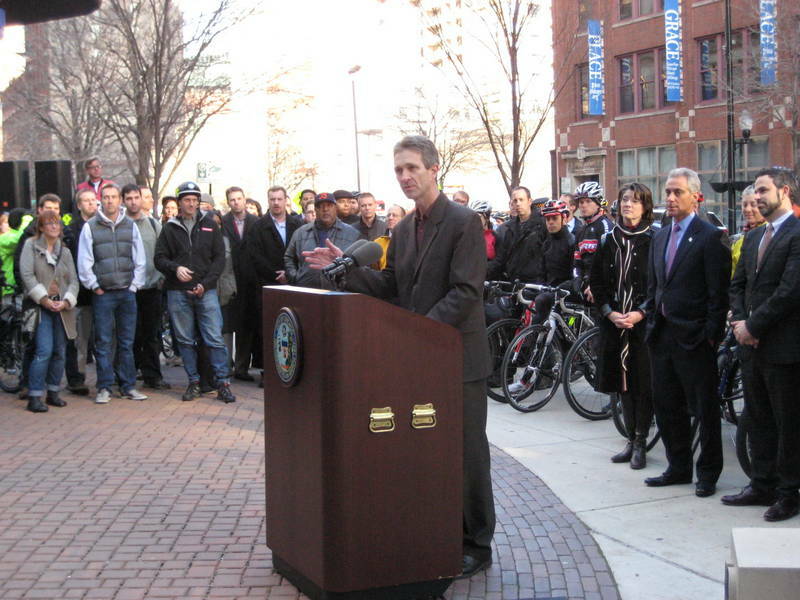 Active Trans Managing Director of Public Affairs Kyle Whitehead reflects on the increasing number of fatal cyclist crashes nationwide in the aftermath of Kane County Transportation Director Carl Schoedel’s own crash. As Schoedel was biking to work, a passing car hit him from behind, throwing him off his bike and into a ditch, where he lost consciousness. Doctors are still evaluating the extent of his injuries, but the avid cyclist plans to continue cycling. After three people were killed by motorists in Niles, Niles resident and Active Trans board member Peggy Reins calls on the Illinois Department of Transportation and the Village of Niles to redesign the streets to encourage safe speeds and safe turning actions for cars, while providing extra protection for people biking and walking. At first glance, it may seem like mayoral hopefuls Toni Preckwinkle and Lori Lightfoot have nearly identical transportation platforms — many policy ideas that Active Trans supports — but the two candidates do have some differing points of view when it comes to sustainable transportation. Active Trans awarded Mayor Rahm Emanuel its Public Leadership Award, which Chicago Department of Transportation Commissioner Rebekah Scheinfeld accepted on his behalf at the nonprofit’s annual awards ceremony. She checked off the mayor’s transportation accomplishments during his two terms in office, including the creation of The 606 and the Lakefront Trail separation project. The hardiest of Chicagoans braved the frigid temperatures to commute to work on two wheels in support of Active Trans’ Annual Winter Bike to Work Day. Illinois State Rep. Theresa Mah worked with Active Trans to campaign for the passage of House Bill 5143, which requires that the Dutch Reach technique be added to the state’s drivers’ manual and drivers’ license exam in order to prevent dooring collisions. Active Trans and the Pilsen Alliance co-host a forum where nine of the 15 Chicago mayoral candidates tossed around ideas for an improved public transit system.